Collaboration at work Call 1-860-571-7136 | Visit www.cerc.com | E-mail info@cerc.com | Connect @CERCInc CERC is proud to honor the projects, people and organizations that are making Connecticut a great place to live, work and do business. The Connecticut Economic Resource Center, Inc. (CERC) is a nonprofit corporation and public-private partnership that provides economic development services, working with state, local and utility partners to leverage Connecticut's unique advantages as a premier business location. 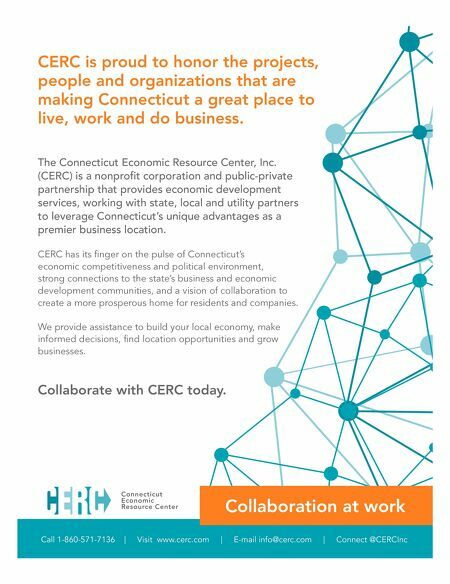 CERC has its finger on the pulse of Connecticut's economic competitiveness and political environment, strong connections to the state's business and economic development communities, and a vision of collaboration to create a more prosperous home for residents and companies. We provide assistance to build your local economy, make informed decisions, find location opportunities and grow businesses. Collaborate with CERC today.